Cowra Crest Motel is family owned and operated by your hosts Adrian and Mei and we provide clean and quiet accommodation in the heart of town. We provide very spacious, fully equipped, clean, comfortable rooms at affordable rates. Relax in the peace and quiet of our 3½ Star motel within 1 block of supermarkets, restaurants, take-aways, shops, churches, service stations, clubs and pubs. 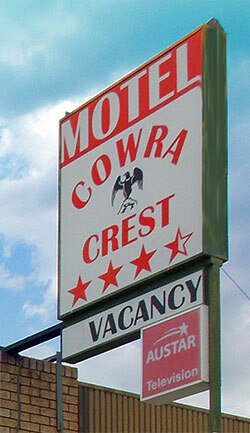 The Cowra Crest Motel offers 12 easy access ground floor motel units, with breakfast-making facilities, microwaves, even the kitchen sink. Enjoy our big Foxtel Entertainment package and Broadband internet access in every room by wireless (WI-FI). Parking is at your door. Each motel unit is well equipped to make your stay very comfortable. Cowra is located in the heart of the central west of New South Wales, about four hours drive from Sydney, two hours from Canberra, one hour from Bathurst, Orange and Young. Cowra is perfectly situated as a base to explore the region, which has so much to offer, and Dubbo, Parkes, Forbes and Grenfell are also within easy driving distance. Discover Cowra, explore the region, and sample our vineyards and fine local food, and experience Cowra's fascinating history. So, whether it's a short break away, staying a while to explore the region, or simply an overnight rest on your journey, enjoy the convenience, comfort cleanliness, country hospitality, and peace and quiet and hospitality of the Cowra Crest Motel.